After passing Element 3, February 2007 I decided it was time to buy my first rig. I compared a few different models that would be considered “entry level.” I consulted Glenn, K6NA about a possible HF rig and he suggested the Yaesu FT-1000MP Mark-V Field. I was unable to find any in used condition and also thought that was a bit beyond a first rig. I decided on the ICOM IC-718. I also picked up an Astron RS-35M power supply and an LDG Z-100 antenna tuner from Ham Radio Outlet. This hardware were added to a few hand me downs from my father, N6SV, including a Kenwood TR-7600 and DC power supply, as well as a Bird 43 wattmeter (with elements!). 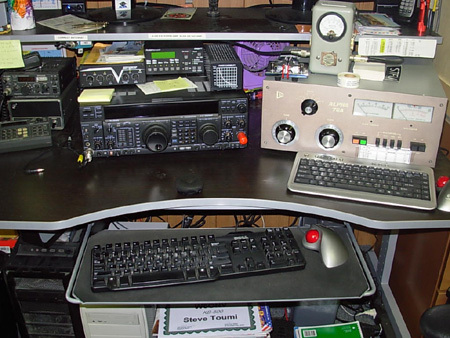 I also started to get involved with ATV and bought a home brew transmitter and Jetstream power supply. After becoming involved in contesting at the end of 2008, I was able to purchase a Yaesu FT-1000MP from N6RO, as he upgraded his station to Elecraft K3 radios. This was a great purchase and should provide me with years of enjoyment. In March, 2009 I inherited a one owner, ETO Alpha 76PA linear amplifier from my father. Knowing nothing about amps, I heard about the reputation of the Alpha. I sent the unit off to N4UQ to be cleaned up and upgraded. These two pieces make up the heart of my station at W6ONV located in Oakley, California (CM98da), which is 60 kilometers east of San Francisco. 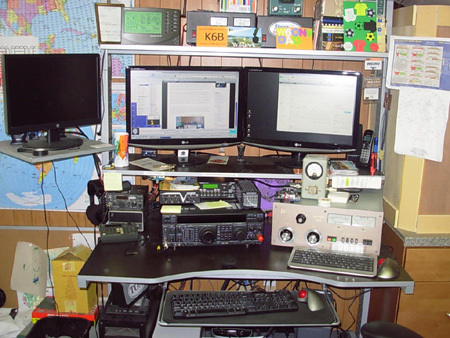 Currently I call CQ on 15/20/40/80M using RTTY/CW/SSB and some of the digital modes (PSK31, Hellschriber & Olivia). I also participate in all major contests throughout the year. To date I have confirmed 50 US states, as I work towards “collecting paper,” as well as the Triple Play Award sponsored by the ARRL. I have worked all continents to date and 115 (unconfirmed) DXCC entities (countries) and have confirmed contacts in Canada, Mexico, Argentina, Asiatic Russia, Alaska, E. Kiribati, Aruba, Bonaire, Cuba, Martinique, Cape Verde, Galapagos Islands, Guatemala, Uruguay, Chile, Brazil, Midway Island, S. Cook Island, East Malaysia, Australia, New Zealand, Antarctica, Easter Island and others. I QSL direct from the information listed on QRZ. No SASE is required if you would like a card. I am attempting to send cards to all my confirmed contacts, but the going is slow and I am behind. 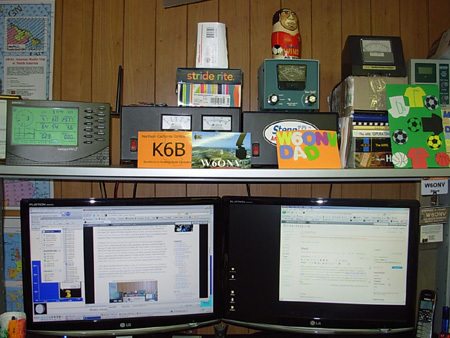 I do use eQSL and Logbook of The World on a regular basis, uploading contacts on a weekly basis and at the conclusion of all contests. You can search my online logbook for any confirm contacts.